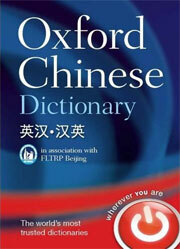 Oxford University Press has just announced that its massive Oxford Chinese Dictionary is now available through its Oxford Language Dictionaries Online subscription service. I haven’t seen the online version yet myself; but from the publisher’s description it appears to be largely the same as the published edition, whose paucity of Pinyin is disappointing. The publisher, however, is promising that “Pinyin will be added to all Chinese translations” in November, which should be a major step forward. Perhaps some of you at universities have institutional access. I would welcome reports. source: What’s New, Oxford Language Dictionaries Online, May 2011. Nciku, a Web site that bills itself as “more than a dictionary,” has a nifty feature that allows users to find Chinese characters by drawing them with a mouse. As you draw, possible character matches will appear in the box to the right of your drawing, with the results refined as your drawing progresses. You don’t need to know the canonical stroke order to get this to work, nor do your calligraphy skills need to be perfect, as this example shows. Once you see the correct character offered as a choice, click on it and it will be entered into the search box for the site’s online dictionary. This dictionary feature can handle multiple-character input and will even prompt you with likely choices to fill out your search.